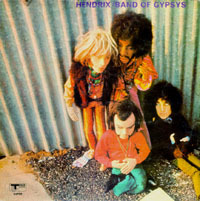 This 1998 re-issue of BAND OF GYPSYS has been digitally remastered by the original engineer, Eddie Kramer. Personnel: Jimi Hendrix (electric guitar, vocals); Billy Cox (bass); Buddy Miles (drums, vocals). Recorded live at the Fillmore East, New York, New York on December 31, 1969. Includes liner notes by John McDermott. Following the breakup of the Experience, Hendrix took a sabbatical in Woodstock, New York, hooked up with bassist Billy Cox, his old Air Force running mate, and began jamming with a wide variety of musicians, including R&B drummer Buddy Miles. Hendrix had become self-conscious about his image as a showman and rocker, and the limitations of thrashing through the same repertoire night after night. BAND OF GYPSYS was an attempt by Hendrix to redefine himself, and marked a slight return to his roots in R&B and the blues, accompanied by a solid, groove-oriented rhythm section. During their brief tenure as a band, Band Of Gypsys performed New Year's Eve at the Fillmore East, and this live recording captures some of Hendrix's most monumental solos, particularly his long, intensely emotional improvisation on "Machine Gun" and his pithy blues work on "Who Knows." Buddy Miles' "Them Changes" illustrates Hendrix's mastery of funk, while "Message Of Love" and "Power Of Soul" demonstrate his remarkable ability to provide a simultaneous rhythm accompaniment and melodic counterpoint to his vocals, in the blues tradition of Robert Johnson.